Gotta love refrigerated crescent dinner rolls. 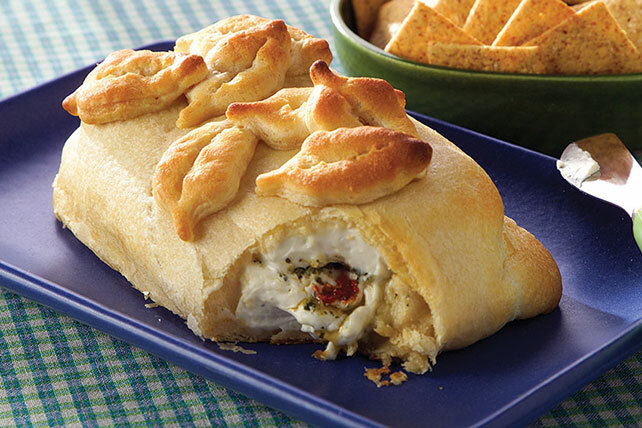 They make elegant appetizers when stuffed with pesto and sun-dried tomatoes. And they're a cinch to prepare. Preheat oven to 400°F. Unroll crescent dough; separate into four rectangles. Place two of the rectangles, side-by-side, on nonstick baking sheet. Firmly press seams and perforations together to seal. Reserve remaining dough for decorative garnish. Cut block of cream cheese horizontally in half. Spread pesto onto bottom half of cream cheese; cover with tomatoes. Top with remaining cream cheese to form sandwich. Place in center of dough. Bring up ends of dough around all sides of cream cheese to enclose completely; pinch ends of dough together to seal. Place, seam-side down, on baking sheet. Cut remaining crescent dough into small fun shapes, such as leaves or fruit. Arrange on top of dough. Bake 20 min. Serve warm with assorted crackers and fresh vegetables. Instead of using leftover crescent roll dough for decorations, shape into crescents and bake as directed on package. Cool, then place in tightly covered container or resealable plastic bag and store at room temperature until ready to serve.